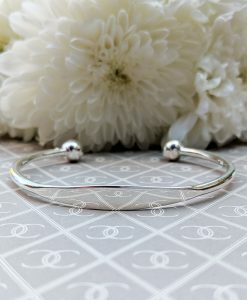 Buy personalised gold and silver bracelets and bangles in our online jewellery shop. 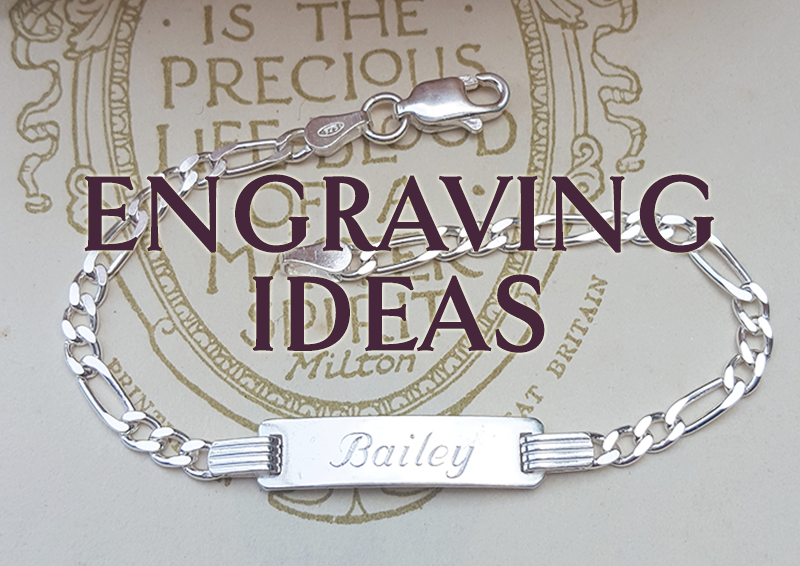 We love engraving bar, disc and ID bracelets with your own special message. We can even engrave your handwriting or own design if you like! Check our engraving gallery. All of our personalised bracelets are beautifully gift wrapped and are delivered fast and free. 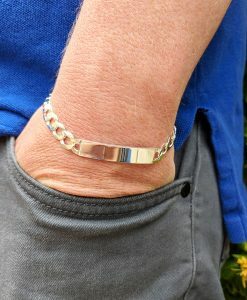 Personalising a gold or silver bracelet is a great way to add a thoughtful touch to that jewellery gift. 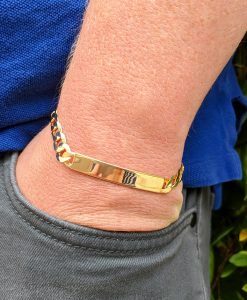 We stock personalised gold disc bracelets, ID bracelets, bar bracelets and we can even engrave your special message on one of our solid silver torque bangles. As well as personalised bracelets for men and personalised bracelets for women, we also stock personalised bracelets for children. We find these small, Figaro ID bracelets are commonly given as Christening gifts, and they make a lovely keep-sake for children as they get older. We engrave our gold and silver bracelets and bangles carefully using a diamond blade. We find etching your message into the bracelet gives a much nicer looking and longer lasting finish. We have a selection of fonts you can choose from, with the traditional italic font being the most popular. If you prefer, we can even engrave your handwriting on our personalised bracelets. We stock a great variety personalised gold bracelets, and these are all made from fine 9ct gold. These are not plated, rolled or filled gold. 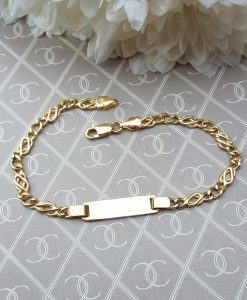 With the proper care, the personalised gold bracelets we sell will last a very long time. 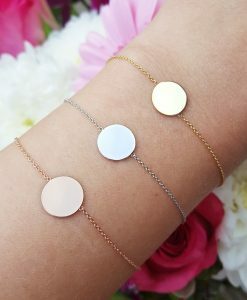 You can choose your bracelet in yellow gold, rose gold or white gold. 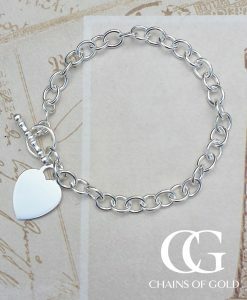 Alternatively, we also stock solid sterling silver personalised bracelets. Silver is harder and more durable that gold, and may be a better choice for young children who are prone to pulling at their jewellery. Whichever of our lovely personalised bracelets you choose, it will arrive beautifully gift wrapped with free worldwide delivery. As well as the UK where we are based, we ship our bracelets to USA, Canada, Australia, New Zealand and Europe. 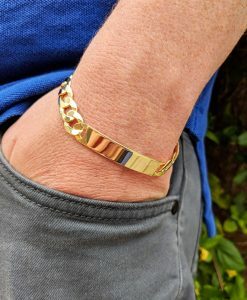 We are registered with the British Association of Jewellers and we are Assay Assured, so you can buy your personalised gold or silver bracelet with confidence. We also warranty all of our jewellery for 1 year.